Instant Imprints San Marcos, CA | Custom T-Shirts, Embroidery, Signs and More! At Instant Imprints San Marcos, our customers come to us when they want to be more visible to their customers. We create that visibility five different ways: Branded Apparel (embroidery), Signs & Banners, Promotional Products, Custom T-Shirts and Print Services. Recommend highly for all your print needs. Is your brand looking to step up its visibility in a big way? Then let Instant Imprints in San Marcos be your source for all things promotional! Our custom t-shirts, printing services, promotional products, custom banners and branded embroidery items are well known for being the best around. This print shop brings together the quality of a global brand leader with the local touch that only North County locals could provide, making it your go-to choice for promotional goods of any kind. At Instant Imprints, we pride ourselves in abiding by a set of core values that informs the service that we provide. We make it a point to get your job done right the first time, so you can avoid the costly revisions that cut-rate print shops provide. Our team of Image Experts is ready to help you craft a superior product, from start to fish. Next time you’re in San Marcos, ask your smartphone, “Where’s the best place to get promotional products near me?” and you’ll be sure to find us! Businesses all around San Diego county know the power of custom t-shirts to bring promotional power to the masses. Your custom tees from Instant Imprints are sure to turn heads, whether they’re seen at the beach, in the hills or around town. Give them away in promotions, or offer them for sale as a way for your most loyal fans to show their support. If you’re looking for an even greater level of style, our custom embroidery service can decorate virtually any garment! No matter where your prospective customers are, there’s a custom sign or banner solution that can reach them. Roll-out banners are durable and portable ways to show off your logo wherever it can serve you best, and our trade show displays can help you make a big impact at your next industry event. If you have questions about which combination of fonts, colors and other design options are best for your project, our San Marcos Image Experts are more than happy to help. 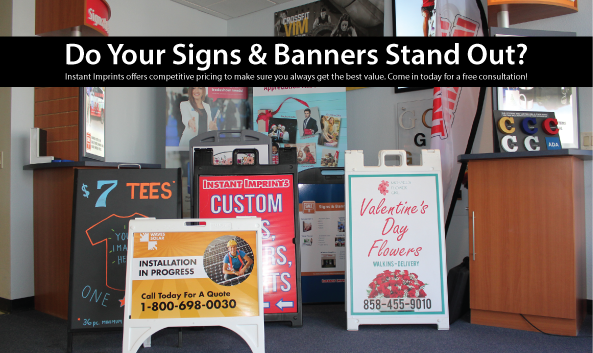 When you’re ready to give your promotional game a major boost, come by our San Marcos Showroom, give us a call at (760) 975-3130 or request a quote online today!